The Asus F570 would have ticked all the right boxes, had it used a faster storage option. Nevertheless, it's a fine affordable gaming laptop for the newbie gamer in you. The Asus F570 is a rather unique gaming laptop in that it’s easily one of the most affordable ones out there in the market. It uses an all-plastic construction but doesn’t feel visibly too flimsy or delicate. The body sports a neat, brushed metallic finish that’s easy on the eyes. The keyboard is easily one of the best Asus has ever made outside of its ROG lineup; the keys are soft and precise and include the long-lost context menu key. There’s an AMD Ryzen 5 processor on the inside that runs cool most of the time. Accompanying the AMD Vega 8 internal GPU is a dedicated NVIDIA GeForce GTX 1050 GPU with 4GB of video RAM. The RAM is a healthy 8GB but the hard drive is a sluggish 1-terabyte unit. How does all of this sum for a gaming machine that’s aimed at students and first-time gamers? Let’s find out. The Asus F570 is only made of plastic on the outside but feels strong enough for everyday use. The top cover feels like it can take scratches and minor bumps but not big drops. 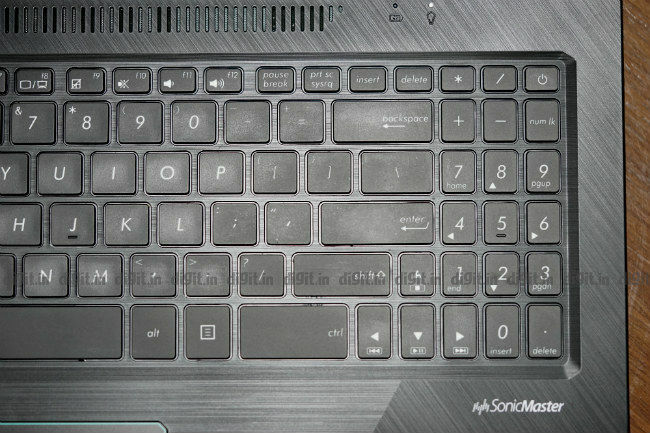 The top cover and the area around the keyboard have a brushed metallic finish, which lends the laptop an attractive look. 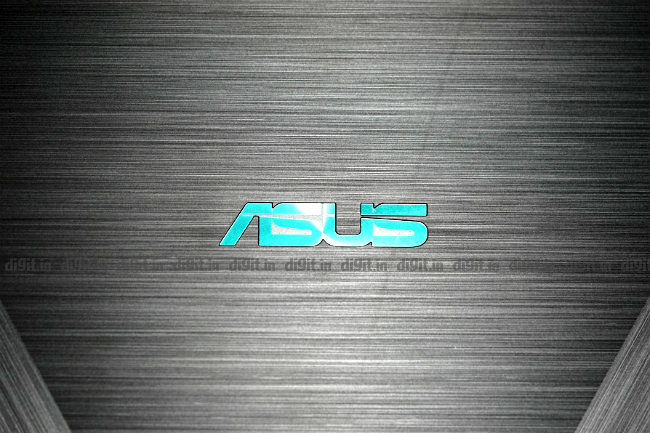 While the body itself is in black, some of the borders and the Asus logo are neatly accented in teal. 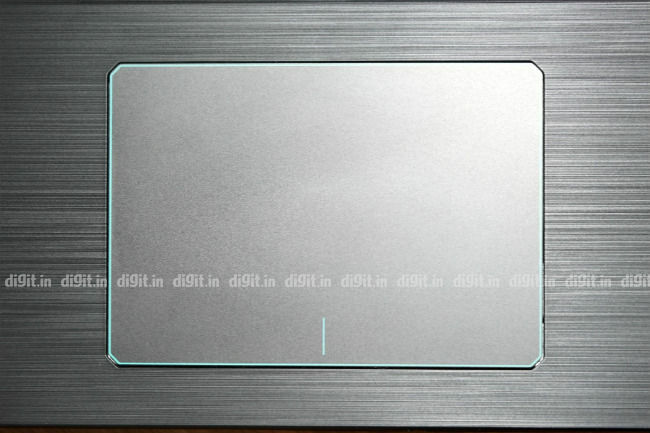 The display can be opened with the push of a single finger but takes some effort, and it will only go a maximum angle of 120 degrees. But be careful not to wrestle the lid open because it's quite slim and flimsy. We hope you don't mind bezels because the ones around the F570's display are thick. 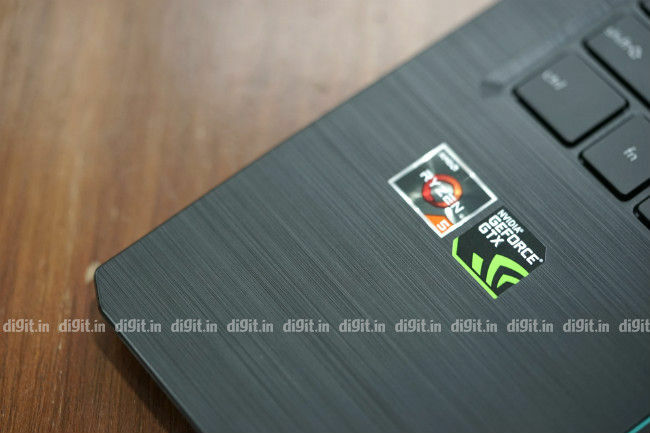 The build and design of the Asus F570 seems commensurate with its reasonable price of Rs 52,990. The display on the Asus F570 is a 15.6-inch Full HD unit with an aspect ratio of 16:9. At 60Hz, the refresh rate is less than half of that offered by the Asus TUF series displays, but given the laptop’s price, that's forgivable. But what's not forgivable is the display’s worrisomely low contrast. The white from the backlight bleeds through the colours badly, to a point where one begins to wonder if Asus has forgotten to add colours to the display altogether. 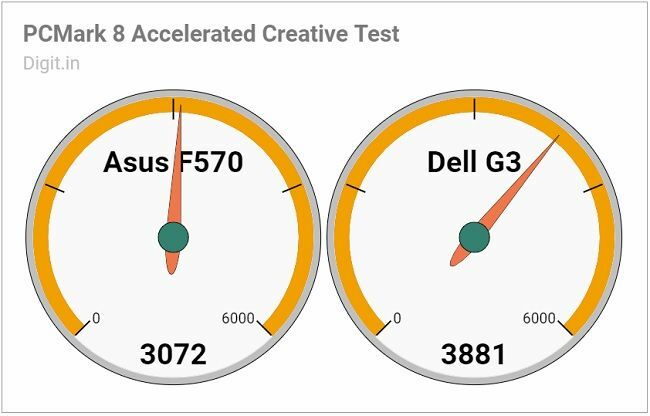 According to our display test, the Asus F570’s display covers only 58 percent of the colours in the sRGB colour scale and 43 percent of the colours in the Adobe RGB colour scale. Audio on the Asus F570 comes through Asus SonicMaster speakers co-developed by the Asus Golden Ear team. The speakers are neither too loud nor too feeble. At max volume, you can listen to instrumental music quite clearly when the cubicles around you in the office are empty. If there’s a noisy gathering around you, you’ll have trouble. These speakers are best reserved for vocals and music that’s not too heavy on bass, because you’ll hear or feel none of it. In summary, they’re a slightly better than the usual concealed, downward-firing speakers you’d find on most affordable laptops. The Asus F570 isn’t shy to offer ports for connectivity. On the left side, we see two USB 2.0 Type-A ports and a 3.5mm jack for headsets, along with a lock slot. On right side, we see the power port, a LAN port, a USB 3.1 Type-A port, an HDMI port, a USB 3.1 Type-C port, and a microSD card slot. What’s not on offer is a fingerprint scanner. Your quickest sign-in method on Windows 10 is a four-digit PIN. Despite a few oddities, this keyboard is one of the best you’ll ever see from Asus. The keys on it are large and soft to press. Even though they seem a bit too soft for accurate feedback sometimes, I find myself having little trouble registering a keypress. The backlighting is single-zone and there are no borders around the WASD keys. This may make some gamers grumble but I’m quite happy with the simplicity of it. 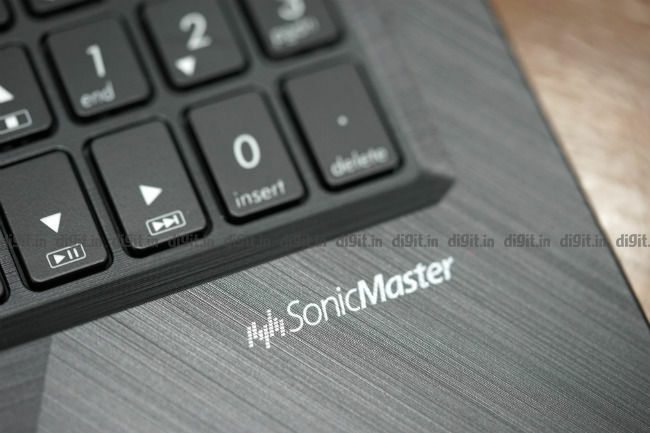 What’s a bit peculiar is that Asus has chosen to make what’s usually an Enter key on that super-slim numpad, a Delete key and the right Ctrl key extra long. No, seriously, that Ctrl key is half the width of the space bar. On the bright side, the context key makes a return on the Asus F570. Hurray! The touchpad on the Asus F570 is a standard precision unit, which makes swiping and clicking a breeze. Multi-finger gestures can be controlled directly through Windows Settings. The physical touchpad keys beneath require some force to be clicked, but are otherwise responsive. The Asus F570 is powered by an AMD Ryzen 5 processor and 8GB of RAM. Taking care of the graphics department is an NVIDIA GeForce GTX 1050 graphics card with 4GB of GDDR5 RAM. The only odd one out in this setup is the storage drive: a Toshiba one-terabyte SATA 3 hard drive spinning at 5,400 rpm. It’s also what I believe makes the F570 more sluggish than it actually is. The review unit scored on the lower side on most of our performance benchmark tests. Working with everyday applications like Google Chrome, Microsoft Excel, and iTunes is mostly a pleasant experience but there are times the laptop stalls for a few good seconds. A cold boot to desktop takes over to a minute to happen. Opening a rarely used context menu within applications or clicking the Wi-Fi icon in the taskbar makes the system hang for a few seconds. Exporting a hundred files in Adobe Lightroom takes close to ten minutes. In my observation, the hard drive is almost always thrashing even when other resources seem available. Do yourself a favour and upgrade to a solid-state drive, or even a hybrid solid-state drive, at the time of purchase. But a word of advice to those of you looking to upgrade later: go straight to an Asus service centre; do not try to open the laptop up by yourself. Not only will the process of opening it up void your warranty, it’ll test your patience quite a bit. 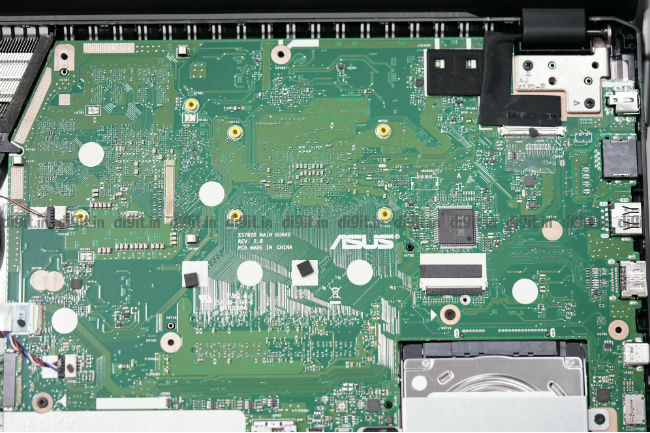 The motherboard is screwed tightly to the inside of the rear cover, which is not a design you see on too many laptops. So, simply unscrewing the rear cover won’t give you access to anything. You’ll have to turn the machine over, open the display up, and take the keyboard off to gain access to the innards. Remember, you can’t just pull the keyboard out without disconnecting the ribbons that run beneath it. Once you’ve meticulously done that, you’ll have access to the battery, the hard drive, and the fan. RAM replacement is a far more complicated affair as it can’t be reached by just opening the keyboard up; you’ll have to get to the other side of the motherboard, which requires a complete disassembly of the elements inside. Gaming performance is surprisingly better than expected on the Asus F570. 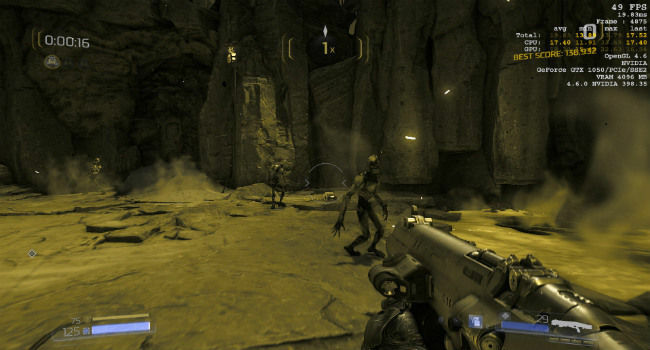 During our test, Doom ran on Full HD resolution and Ultra graphics settings at around 50 frames per second, and dropped to 40 frames per second during action sequences. Lowering the settings to Medium bumped the frame rate up and locked it at 60 frames per second for most of the gameplay. Metro: Last Light, on the other hand, ran rather badly on the Asus F570. Regardless of the graphics settings, the frame rate did not cross 20 frames per second. This game, sadly, is best played on Low settings. What’s nice about the F570 is that at no point does the package temperature of the AMD Ryzen 5 processor cross 50 degrees Celsius. There’s no apparent heat on the keyboard surface or the base. Remember that the AMD Ryzen 5 has a TDP of 15W and is rated for a max temperature of 95 degrees Celsius, but it probably stays so cool because of the single fan on the inside. 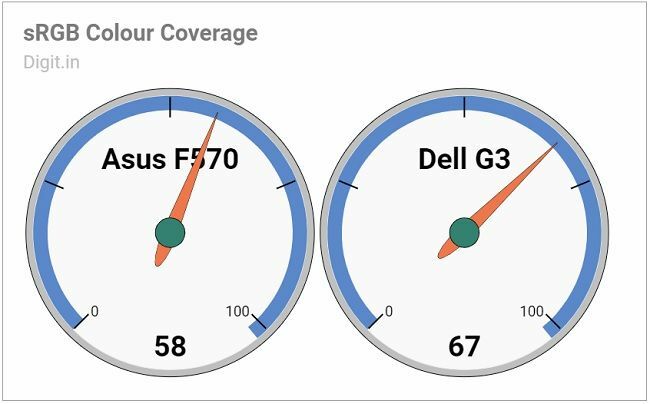 Battery performance on the Asus F570 can be described as average at best. The review unit scored 5 hours, 20 minutes on our standard battery benchmark test. 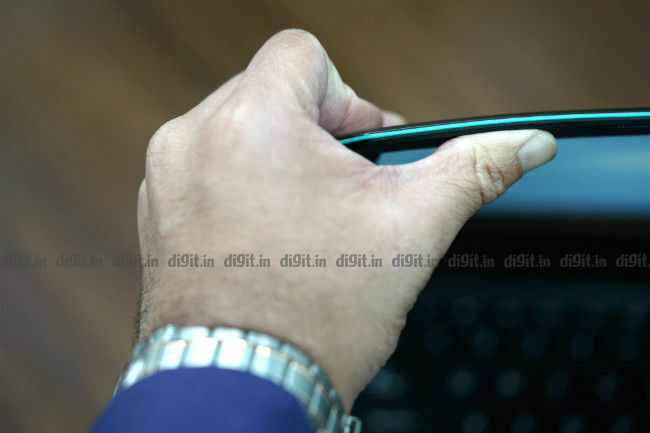 On daily usage tests, where Wi-Fi and Bluetooth are turned on, the screen brightness is set to 60 percent, and CPU usage is on the higher side, the Asus F570 lasted about three and a half hours on a single full charge. Charging from 20 percent to full took two straight hours. If you’re using it for some light web browsing, expect about four hours of battery life at most. The Asus F570 is definitely a model to consider if you’re a student looking to play lightweight game titles on an affordable laptop that you can also take to college. It’s built decently and has enough power for video-editing tools. That said, be mindful of the F570’s poor display; it looks practically colourless. Considering everything, you needn’t think twice about buying the Asus F570. You just need to get that hard drive replaced with a solid-state drive through Asus.